TaylorMade golf clubs – PGA Tour pros like Dustin Johnson, Jason Day and Sergio Garcia can be seen swinging TaylorMade clubs in tournaments watched by millions almost weekly. Best known for innovating metal drivers starting in 1979, TaylorMade remains the largest golf equipment and apparel company in the world. Fore! Taylor Guitars – Used by world-famous musicians including Jason Mraz and Taylor Swift, Taylor Guitars – located in San Diego’s East County – is the world’s leading guitar manufacturer. With operations on both sides of the border, Taylor maintains a high-level of quality control over its products. Stone Brewing craft beer– The recognizable gargoyle and award-winning beer from Stone has made waves for taking on “corporate beer”. Started in North County in 1996, Stone now boasts seven locations including a newly opened brewery in Berlin. Cheers! Illumina's instruments for genetic sequencing – Recently named the “Google of Genetic Testing”, Illumina has taken over San Diego’s UTC business center which houses the company’s worldwide headquarters and more than 2,000 employees. More than 90 percent of the world’s genetic sequencing is done on Illumina instruments. Celebrate with us October 7. Visit sdmfgday.com to get involved. On October 3rd, more than 28 San Diego companies opened their doors to the public as part of National Manufacturing (MFG) Day. As one of the founding members of the local event, the team at D&K Engineering was behind the day’s success. More than 100 people lined up to tour its Rancho Bernardo headquarters where many of the world’s most innovative products are made. With a wide-range of expertise - including kiosks, medical devices, 3D printers and more – D&K Engineering is redefining the way we think of product manufacturing. Its products and expertise illustrate the way manufacturing has evolved to become a high-tech process that creates applications that change the world. This product intuition has helped them yield results: the innovator saw its manufacturing business grow by 90 percent from November 2012 to November 2013. This is the type of growth that lands a company on the Inc. 5000 list five times. For this week’s Investor Spotlight, we sat down with D&K Engineering’s CEO Scott Dennis to learn about why the innovator chooses to grow in San Diego. D&K Engineering provides end-to-end R&D, product development and manufacturing services for high-innovation content, hardware-based products. We help enterprises become leaders in their industries by creating and manufacturing breakthrough hardware-based products that lead to profitable, enduring lines of business for our clients. We achieve this by employing world-class R&D and manufacturing talent, deploying state-of-the-art product realization processes and leveraging our global infrastructure and supply chain to design and manufacture innovative products on a service basis. San Diego based ecoATM is a great example of one of D&K Engineering’s many end-to-end client relationships (R&D through manufacturing). As the engineering and manufacturing engine behind ecoATM, we helped them quickly achieve market leadership by designing and delivering a fully-automated kiosk that was deployed to the market and generating revenue within a 12-month period. Today, ecoATM is the leader in the electronics eCycling kiosk industry. Although D&K Engineering provides services to companies around the world, San Diego is an ideal location to call home. Some key advantages of doing business in San Diego are the broad base of industries located in the region, the deep pool of R&D and manufacturing talent available, geographic proximity to Mexico and easy access to Asian markets and supply chain. San Diego’s industry base includes many market-leading and emerging companies in a wide variety of industries such as medical, life science, wireless, 2D and 3D printing, kiosks, and defense. Most organizations in these industries partner heavily with service-based companies to assist them with developing new, innovative products and manufacturing them on an ongoing basis. The education level and specialized skills of the talent pool in San Diego is a competitive advantage for our business. Not only does the region provide a talented pool of experienced workers, but its world-class university system, including UC San Diego, San Diego State University, the University of San Diego and others, continually provides a great pool of new engineering and business talent. There are many San Diego based companies that are innovators and global leaders in their perspective industries. A few of these companies include: iboss, a web security company developing innovative security solutions and a prominent member of San Diego’s growing cybersecurity industry; Hologic GenProbe, a medical device company developing diagnostic products to help improve patients’ lives; Illumina, a medical device manufacturer developing advanced DNA sequencing solutions and products used in the advancement of personalized medicine. D&K expects continued regional and global growth in both our engineering and manufacturing services business over the next five years. With the goal of achieving a global leadership position in the product realization services industry, D&K offers San Diego the advantage of having a global industry leader in their own back yard that can help expand the burgeoning pool of technology based companies who call San Diego home. On May 28, U.S. Secretary of Commerce Penny Pritzker announced the first 12 communities that have been selected to participate in the Investing in Manufacturing Communities Partnership (IMCP). Joining forces with many partners across the region, San Diego is included in the Southern California Designation, which was led by a team out of the University of Southern California Center for Economic Development. The IMCP program is an initiative designed to revolutionize the way federal agencies leverage economic development funds by encouraging communities to develop comprehensive economic development strategies that will strengthen their competitive edge for attracting global manufacturing and supply chain investments. So what exactly does this mean for San Diego and the Southern California region? 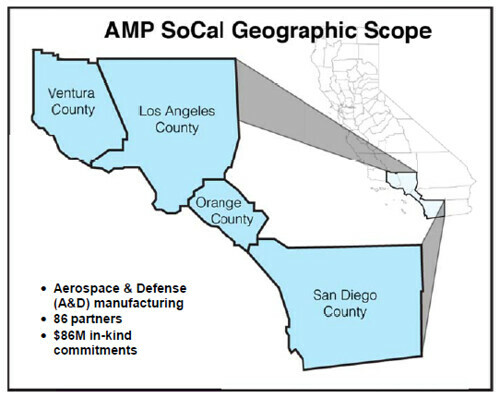 As home to the world’s largest concentration of military personnel and with more than 80 percent of the state’s aerospace workers, the Advanced Manufacturing Partnership of Southern California Manufacturing Community (AMP SoCal) will concentrate on further transforming the aerospace and defense industry. Home to companies including Northrop Grumman, the Southern California region is positioned to be in the vanguard of future avionics and aerospace industries. Of course, you can’t become a leader in aerospace and defense without the workforce to get you there. Part of the strategy will involve a significant workforce training component that will partner with local colleges and universities to streamline certificate programs. The strategy also focuses on building a supplier network, research and innovation, infrastructure and site development. The strategy will also focus on creating an export acceleration workshop, which dovetails nicely into the Global San Diego Export plan, which was released in conjunction with the Brookings Institution this year. 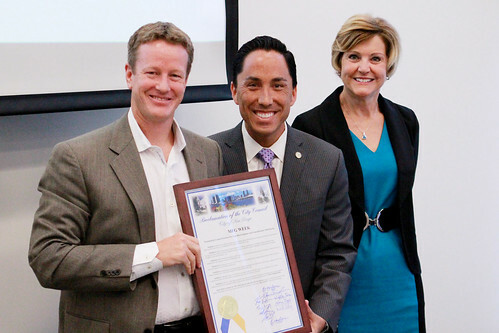 On the local front, the partnership involves the City of San Diego, CONNECT, UC San Diego, Cleantech San Diego, San Diego East County Economic Development Council, San Diego Workforce Partnership and San Diego Regional EDC. Following the success of last year’s MFG Day, on Oct. 3, many of the partners listed above will team up with local companies as they open their doors to the public to showcase an industry that supports nearly 90,000 local jobs. Stay tuned for more details.